Whether you are looking for a scale-out or scale-up solution, SANS Digital offers the best of both worlds. With data almost doubling every year, many IT administrators have the difficult task in keeping up with this growing demand. One way is to scale-up by simply upgrading existing servers, the other way is to scale-out with SCALA Storage by aggregating the computing power of multiple servers. Different from traditional SAN or NAS solutions, we have eliminated controllers or gateways letting application servers communicate directly with storage nodes. The SCALA Storage solution is fully market proven with multi-PB level customers who have been using our product for many years with over 50% cost savings against the leading competition. Traditional network-attached storage (NAS) is relatively easy to setup, access files, and expand capacity but it does have its limitations. 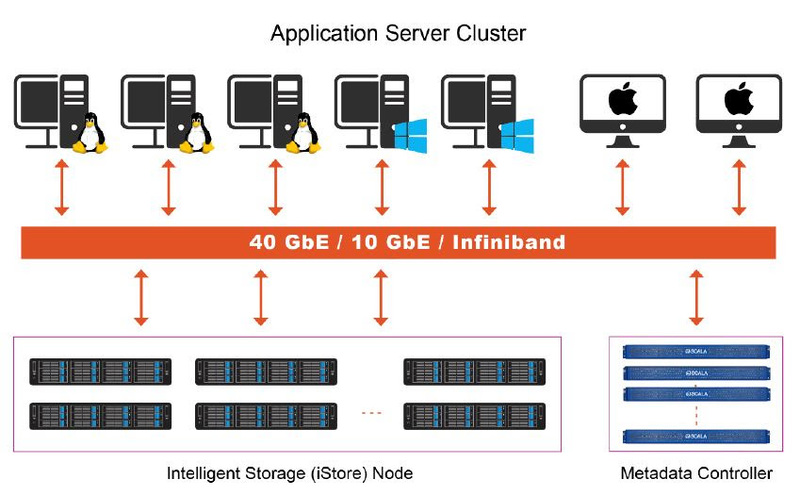 Maxing out a traditional NAS's capacity results in server bottleneck making it tough to manage. Organizations looking for increased flexibility have been turning to SCALA Storage as the answer. Whether you're seeking to reduce performance delays when working with larger files such as video or would like a more future-proof solution that will allow you to seamlessly grow your overall capacity while at the same time increasing the total performance throughput then SCALA Storage is the solution for you. Media & Entertainment, Video Surveillance, Universities and many more. SCALA Storage is easily scalable from hundreds of terabytes to multiple petabytes, while still providing a predictable linear performance increase and high availability storage structure. 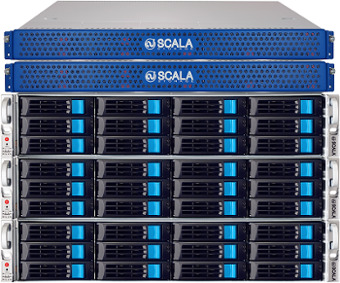 SCALA Storage delivers extreme capacity and performance while offering a low, total cost of ownership that no other scale-out solution can provide. 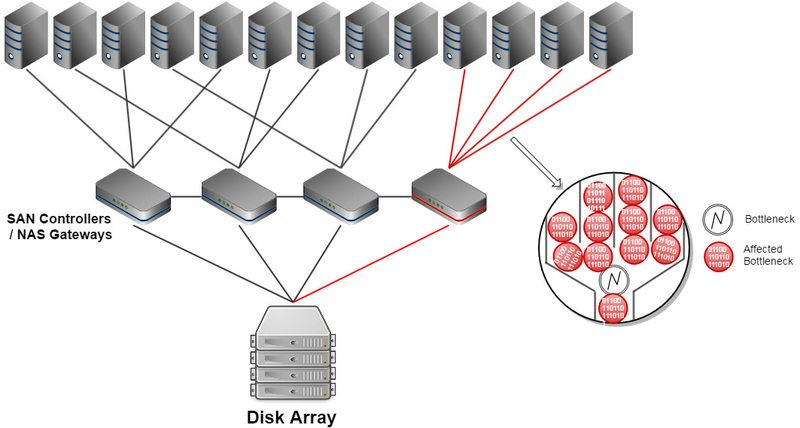 High-Concurrency Access: The overall performance of traditional SAN or NAS during high concurrency access is dramatically decreased due to the physical limitations of hard drives, controllers and network architectures. 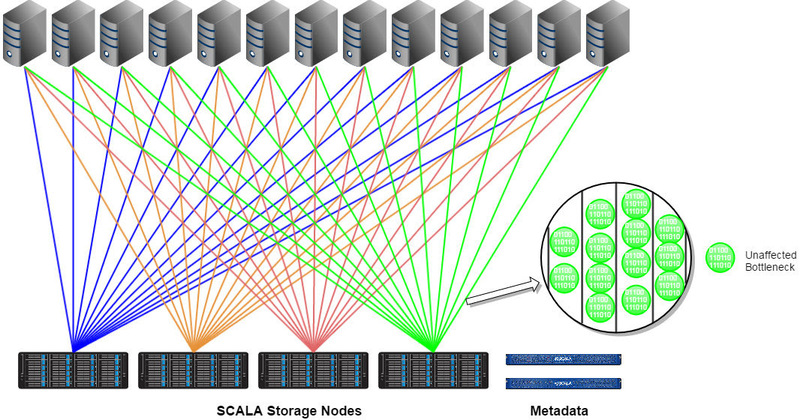 SCALAfs is designed to support high concurrent access by dividing R/W data into separate storage nodes, allowing individual clients to access data from all nodes for aggregated performance throughput - virtually eliminating physical limitations. High performance: Increase the total system bandwidth and performance as you increase your storage. A 2PB rack of storage nodes with SATA disks and dual 10GbE has been proven to deliver 18GB/s throughput with high concurrent access for all clients. Proven proprietary file system: Eliminate performance bottlenecks of traditional storage enclosures without the use of SAN controllers or NAS gateways. Easy scalability: from 3 nodes of 36TB to a multi-node, >300PB cluster all in a single volume with virtually no rebuild time compared to that of traditional RAID. Reliable File-level RAID: Enables up to 80% utilization, data recovery time is only 1/5 vs. traditional RAID, recovering 3TB in 30 minutes. Self-monitoring mechanism: Proactively singles out inactive hardware to provide high data availability. 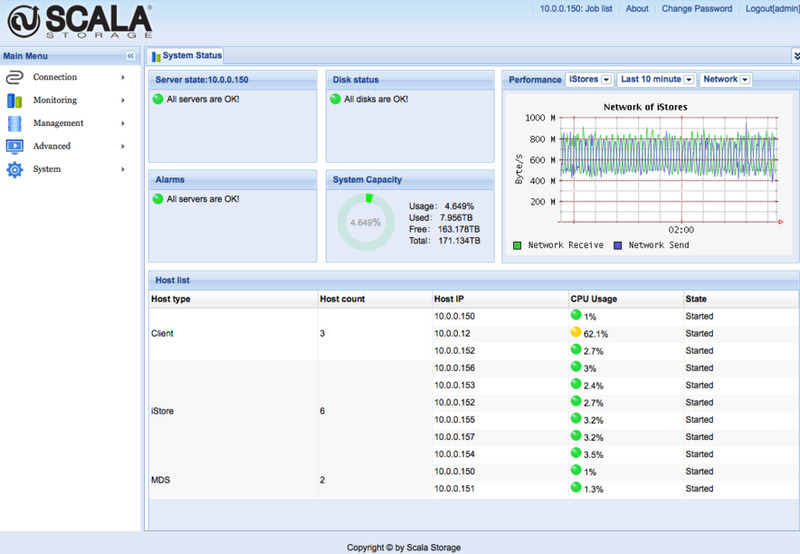 Single log-on page for simple management: One part-time IT staff can manage PB levels of storage. 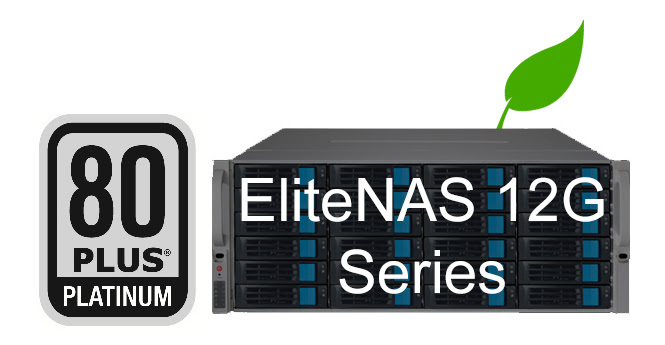 Increase the performance of your existing data center by upgrading existing servers to the new SANS Digital EliteNAS 12G. Scaling up is all about upgrading to the latest processors, RAM, and storage capacity. 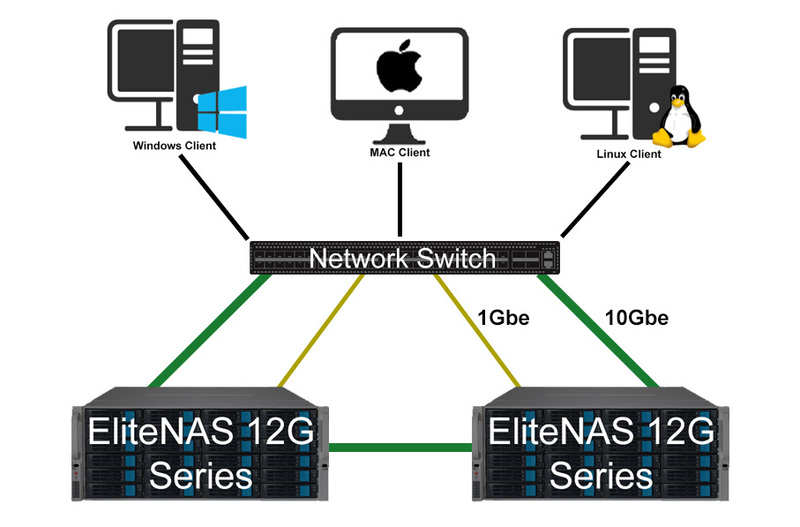 The new EliteNAS 12G series is SANS Digital's newest NAS+GbE+Fibre Channel unified/hybrid storage rackmount series with full support for Windows, MAC, and Linux sharing, dedupe, SSD caching, hardware encryption, iSCSI and fibre channel targets plus much more*. The EliteNAS 12G series is a feature rich unified storage system capable of meeting the most demanding networking and data storage needs with components such as Intel's E3 3.5Ghz CPU processor, up to 128GB DDR4 Memory, and more. In the event of a head node server failure, the secondary server automatically takes over to service the failed head node server. The ACM feature ensures continuous service with no down time. Built-in highly energy efficient 80+ Platinum PSU with the ability to automatically spindown the hard drives. 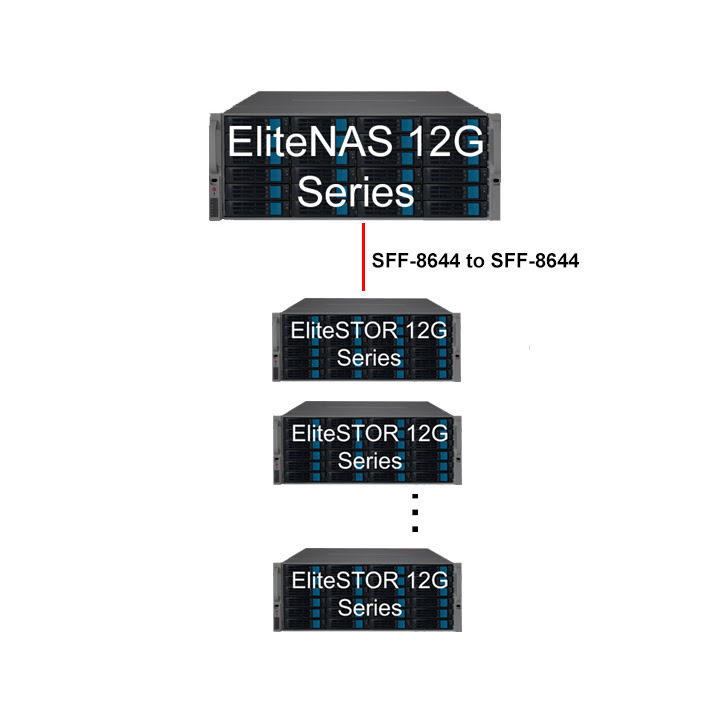 Connect additional SAS expander JBODs (EliteSTOR 12G Series), or up to 120 total drives or 960TB.